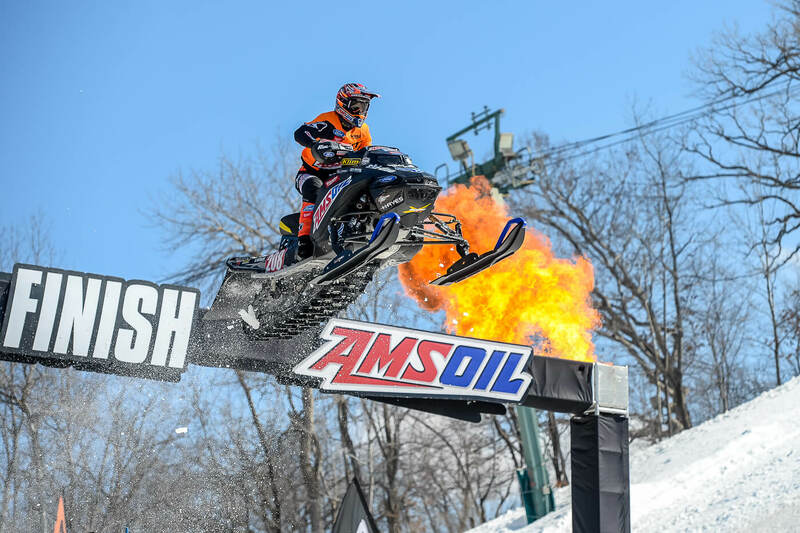 After four-and-a-half months of bar-to-bar racing, the 2018-2019 AMSOIL Championship Snocross, POWERED by RAM has two first-time champions atop its premier classes. Ski Doo riders Elias Ishoel and Hunter Patenaude both secured their respective points championships on Sunday in Lake Geneva, Wis., with each winning their respected finals. While their storylines to success have similar characteristics and endings, their season-long narratives couldn’t be more different. The red plate could be considered a target, for whomever holds the coveted number plate has every other rider taking aim week-in and week-out. 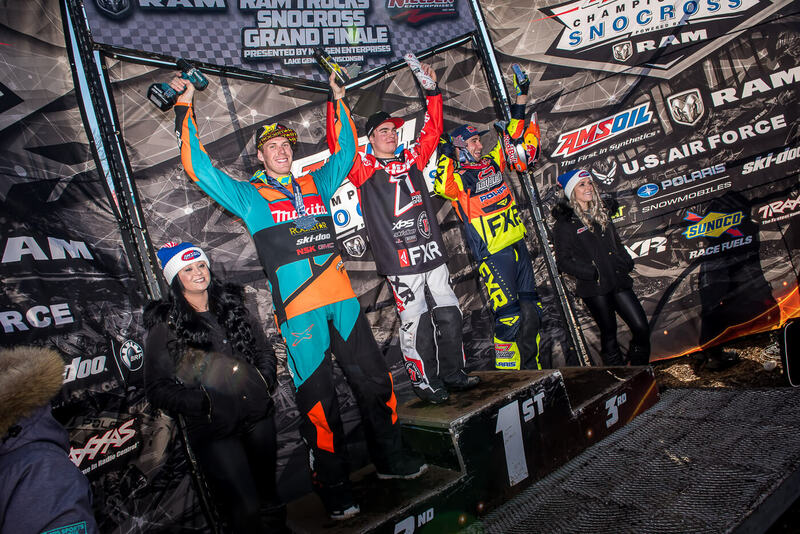 Elias Ishoel grabbed the red plate by winning the opening round in Duluth and kept finding ways to keep it despite several surges from different riders throughout the year. Ishoel was the most consistent and successful pro for the first two months of the season. A win and a third in Duluth, a win and a fourth in Jackson Hole and two third place finishes at Canterbury Park kept the Boss Racing driver atop the standings. 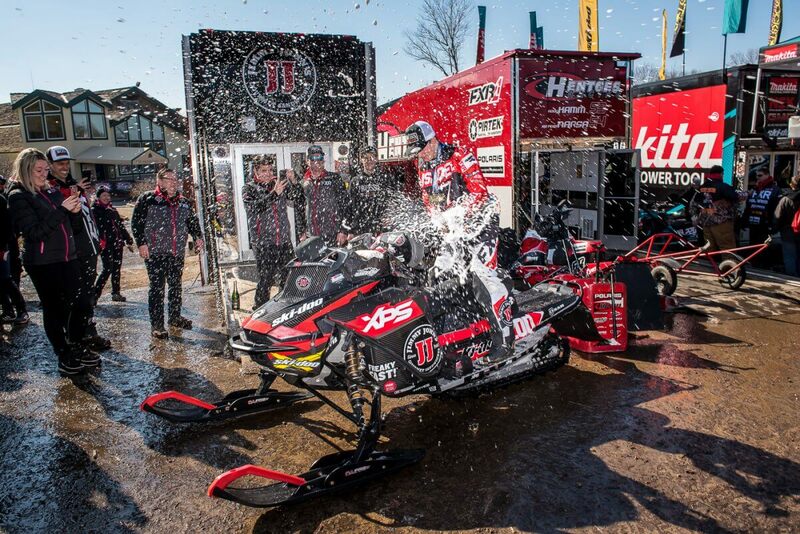 The first to take aim was Scheuring Speed Sports Lincoln Lemieux, who also won in Duluth, and picked up wins in Jackson Hole and Canterbury to keep pace with the front running Ishoel through six rounds. Lemieux’s last big push towards overtaking Ishoel came in Deadwood, where Lemieux continued to dominate finals. The Vermont driver won for the fourth time, and finished third on Saturday. Meanwhile, Ishoel’s stranglehold on the lead had diminished after finishing last on Saturday. What was a 53-point lead was now down to 25. But after Deadwood, Lemieux would deal with shoulder injuries that left him sidelined for the rest of the year. In his place, Warnert Racings Adam Renheim and Tim Tremblay started gaining traction, as did Hentges/Polaris’ Kody Kamm and Ishoel’s own teammate Aki Pihlaja. Over the next few rounds, Ishoel would find ways to bounce back from a tough Deadwood event, and kept winning heat races while he searched for the early-season winning formula. A pair of second place finishes over four rounds allowed several racers to inch closer to Ishoel, with Kamm looking like he was preparing for a late season run. Instead it was Ishoel who closed out the season in championship fashion. His success in Iowa was the type of racing points leaders look for when trying to close out the competition. Ishoel was dominant in the Hawkeye state, winning both finals and finishing first or second in his heats. What was becoming a tight lead, increased in the blink of a weekend, and Ishoel and his Boss Racing team headed to Lake Geneva in command with three days of racing left. Historically, Geneva has a way of messing with championship dreams, but Ishoel had kept to his mid-season promise to go out and have fun again, and came out swinging on Friday night with a win. His lead had grown to more than 40-points over Kamm, and by Sunday morning, a start in a heat race sealed the deal. But Ishoel decided to go out as he came in, with a win. His ride was consistent with his season, one that showed a smart, strategic rider, and despite several lead changes out front, Ishoel waited for all challengers to come, and fall away, before taking the checkers. The win in Geneva was his fifth on the year, which also included 11 podium’s in 17 rounds. For Ishoel, it was a fitting end to a great year, and since he had the title wrapped up prior, he was able to let loose in the final. To the victors go the spoils, and along with the Pro championship, the Boss Racing continued its dominance in the end of the year awards program. Boss Racing was also honored with Team of the Year, fueled by Ishoel’s championship, as well as a great season by rookie Pihlaja, who finished with two wins and five podiums in the Pro class. 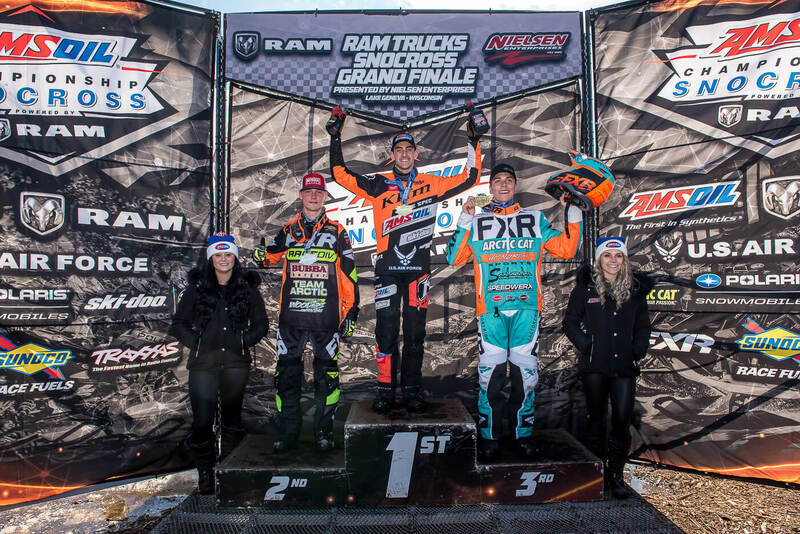 Boss Racing also brought home three amateur titles, thanks to rising star Jordan Lebel. Ishoel was also honored with the Pirtek Performance Award and as the series Fan Favorite, which came as a surprise. Kamm held his spot as runner-up in the final rundown. Tremblay finished third despite not winning a final and his teammate Renheim was fourth overall. Rookie Benham finished fifth. 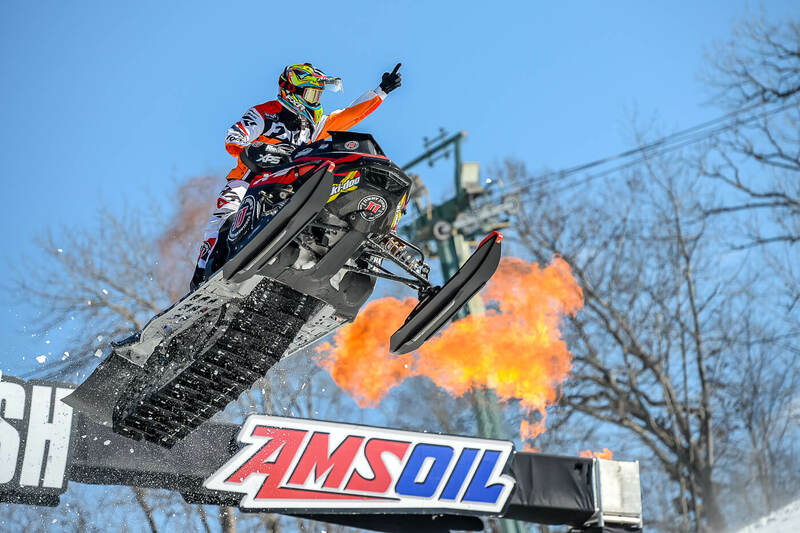 Ski Doo’s Hunter Patenaude ascent to the top of the Pro Lite standings was one that was expected, but then possibly forgotten once the season actually started. Patenaude never really struggled, but there was also a full field of young, and hungry riders looking to make their mark in the wide-open class. Through the first seven rounds, Patenaude had a pair of podiums, two second place finishes. It seemed everyone around him was finding the top of the box, with five different winners in the first seven events, including four rookies. 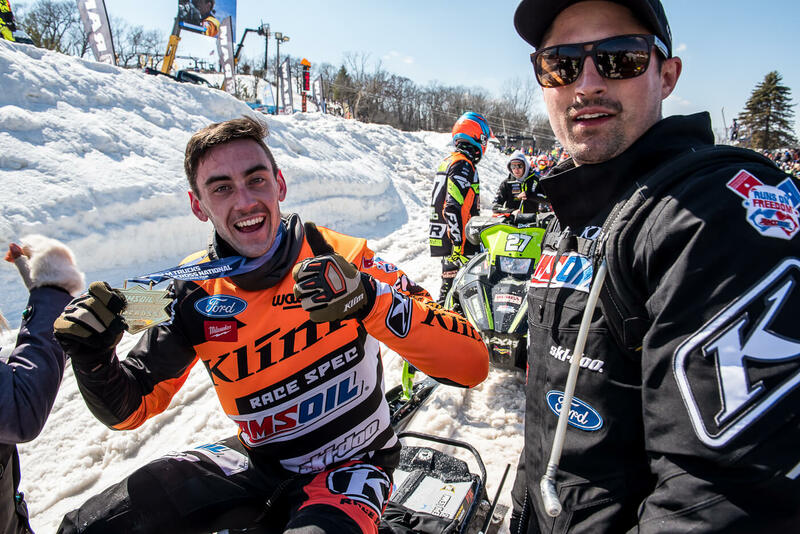 Meanwhile, Ski Doo’s Francis Pelletier was being consistent and in control of the points standings. The chaos theory behind Pelletier was palpable, and it allowed him to hold on through the first half of the season. But Patenaude had the talent and the team to break through. Originally brought in as a fill-in rider last season for Tim Tremblay, he was re-signed in the off-season with the promise of bring a title to one of the sports legacy teams, Patenaude found his stride after a last place finish in Deadwood in round seven. The next night, Patenaude broke through, picking up his first career win. That win sparked a boost of confidence that is rare in motor sports. Over the next eight rounds, Patenaude was simply dominant. He picked up nine straight podiums to close out the season, with six of those being wins. He took the lead over Pelletier prior to Iowa and extended his lead before heading to Geneva. In the last two rounds, Patenaude never let off the throttle, winning both days and cementing his first career Pro championship. Warnert Racings Francis Pelletier took home the series Most Improved Award. 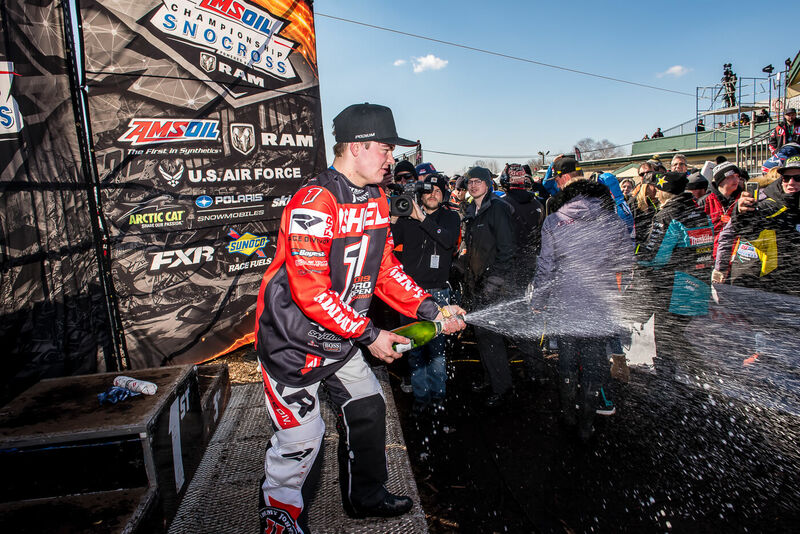 Despite breaking his wrist in Lake Geneva, he finished second overall in Pro Lite. Pelletier finished with ten total podiums. 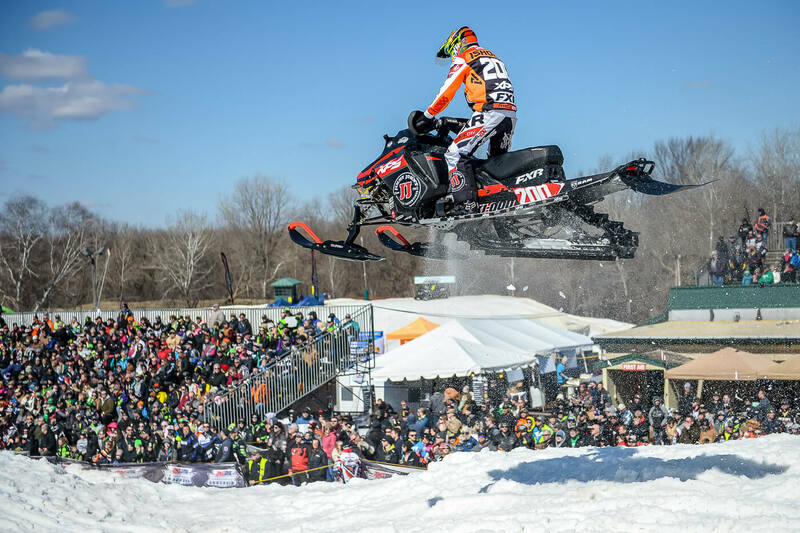 Arctic Cat’s Daniel Benham took home Rookie of the Year. Benham kept getting faster and faster as the season went on, and picked up a win in New York on his way to a fifth-place overall finish. 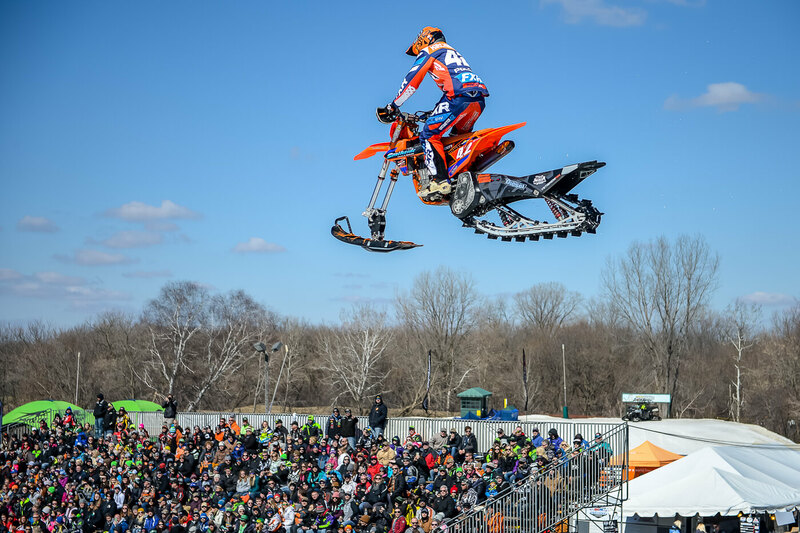 Jesse Kirchmeyer show off some big air on Sunday for the win in Snowbike, taking home his first career championship.